Yonatan Gat's days in Israeli garage-rock band Monotonix were numbered from the beginning. When a band makes a habit of performing live shows that are so off-the-hook chaotic that they're actually dangerous—frontman Ami Shalev broke his leg in the middle of a 2010 concert—it can be expected to reach a critical burnout point eventually. "Monotonix is a band that's played a thousand shows in its five years of existence, and I think we always knew that this project doesn't have a long time to continue," says guitarist Gat, who was born in Tel Aviv but is now based in New York City. "That's the nature of the project itself; it was very, very demanding and very physical." In addition to pushing themselves to the point of exhaustion and injury, Gat's former bandmates also began having family obligations that conflicted with Monotonix's touring schedule. So they decided that instead of performing less and less, slowly diminishing before sputtering out, they'd go out in a blaze of glory. In 2011, the members of Monotonix abruptly went their separate ways. "We figured that we're either going to do it completely like we did ... up until that day, or we're just gonna stop completely," Gat says. The split freed Gat up to more intensely explore his role as a guitarist, a calling he'd found with Monotonix, which was the first band in which the former bassist had played guitar full time. For Gat, guitar was a key that could not only unlock infinite improvisational avenues in a song—as evidenced by his masterful world-influenced style that combines psychedelia and punk—but also his creativity as a solo musician and, later, with his current band. "After playing a thousand shows with Monotonix, I noticed that I'm actually a guitarist, and I can do a lot with that instrument—a lot more than I thought before," Gat says. "And [I] let go of the idea of what kind of guitarist I am. 'Am I a rock & roll guitarist? Am I a punk guitarist?'—whatever. Once I let go of those ideas, I just discovered that I could go in a lot of unexpected directions—some of them surprise me, too." 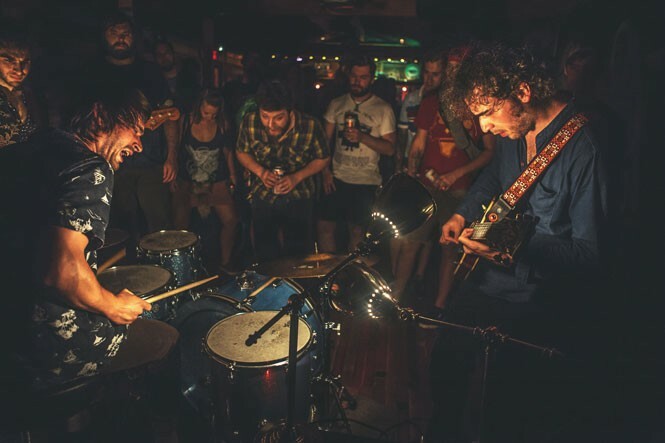 Gat's band in its current incarnation (with Israeli drummer Gal Lazer and Brazilian bassist Sergio Sayeg) is relatively new; after Gat left Monotonix, he honed his improvisational chops by performing solo shows. But when he met drummer Igor Domingues in Portugal, Gat says he was so inspired by Domingues' innovative "beats that were very rock & roll and punk on one end" and also incorporated African and Middle Eastern influences, that Gat collaborated with Domingues for one album: 2014's intoxicating Iberian Passage. When Gat founded his trio about a year ago, he kept the world influences he explored on Iberian Passage, as well as his focus on improvisation. So despite the fact that Gat was again playing with two other bandmates, the project retained a sense of unfettered creative freedom. "Now that I'm doing this project, it's much easier to take much more unpredictable paths, and just by the fact that it's still a very, very collective effort, the whole premise of the thing is improvisation," Gat says. "So we basically go into a show or go into the studio and see where that leads us." Most recently, the place Gat, Lazer and Sayeg have been led in the studio is technically many places. Their first release as a trio, Director—released in March—is a colorful, evocative journey "between different parts of the world, different styles of music," Gat says. Through prismatic instrumentation and contagious energy, songs like the intensely kinetic "Gibraltar" and the restless guitar-driven "Gold Rush" transport listeners to faraway unfamiliar locales, and all are tinted with the band members' own experiences of traveling the world. "Our music comes from us," Gat says. "It comes from where we are, it comes from where we live, where we lived, the people that we are." Gat and company are already working on their as-yet-untitled next album, set for release sometime in the fall, but whatever plans the band has for it could easily change. Because, like Gat's fingers as he lays down an intricate guitar riff, the direction their music takes is dictated only by the present moment. "We definitely try to not confine ourselves to any limited ideas or concepts that we walk into the studio with and try to keep things open, so the music will be the true expression of what we are," Gat says. "Because that's the idea: to express who you are, where you're from, where you are at the moment, what you've seen, your thoughts, your being through playing. And that's what the guitar enables me to do."